i recently purchased a 258v from another wiggler to replace my 258r to take advantage of the better tracking. i got it this week, and was puzzled when feeding (1.2v/oct) quantized CV signals into the gray input was not yielding proper scaling. further testing revealed the gray inputs were scaled to (almost) 1v/oct. i tried to adjust the top oscillator scaling to respond properly to 1.2v/oct, but came up short. 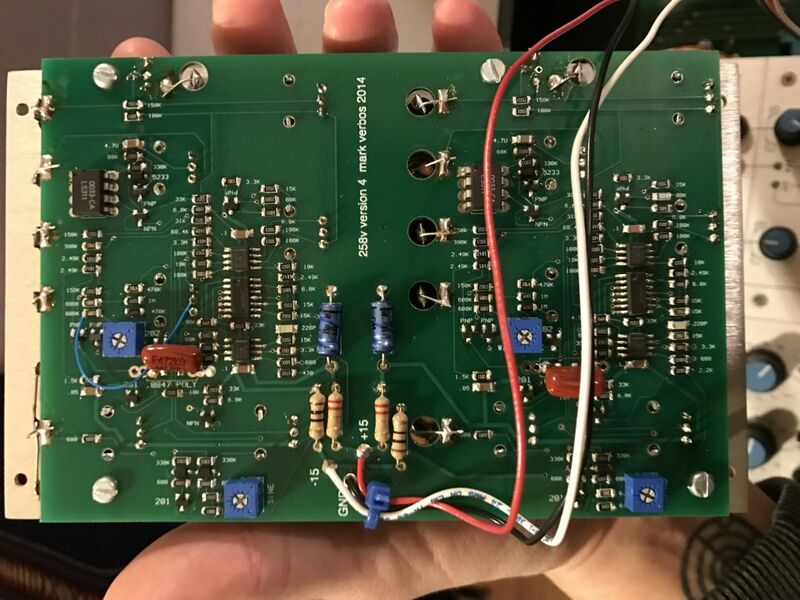 does anyone know if mark verbos made any of these to track at 1v/oct rather than 1.2v/oct? once i figured out i couldn't scale to 1.2v/oct properly with the trimpot next to the CV input, i recalibrated for 1v/oct, and it tracked very well across about 6 octaves- much better than my 258r, which i'm lucky to get 2-3 octaves of accuracy from. i've reached out to mark, but i now he takes a while to respond sometimes, if at all. so putting this out there to the community to see if anyone can shed some light on the situation. Depending on the rev of your 258v there may be 4 trimmers or 2 trimmers on the back of the PCB. If you have the 4 trimmer version, the next trimmer over from v/oct scaling trimmer is the initial frequency trimmer. When I calibrated my 258v, I adjusted the initial frequency first so that it output 5cps when the frequency knob was at 5cps. I then calibrated using A440 as the base frequency and A1760 as the top frequency. Worked quite well. 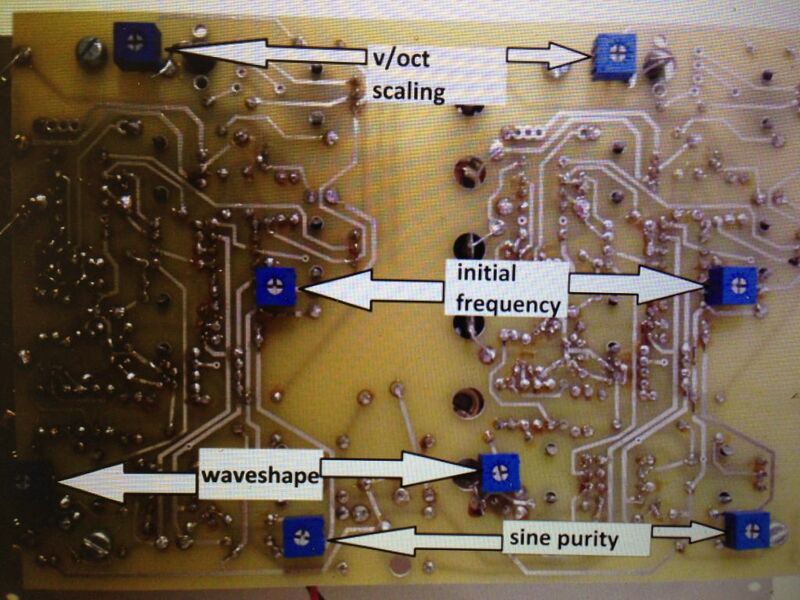 on the back, there are four trimmers- a "SINE" and "WAVESHAPE" (going off memory here) for each channel. then the trimmers next to the CV input on "front" of PCB. i'm using kenton USB solo set to 1.2v/oct as a CV source. it's pretty accurate in my experience. thanks for the input, mritenburg! i'll snap a photo of the back when i get home, but can confidently say this does NOT look like the back of mine. I thought 1V/Oct was the whole point of having the gray input? Am I mistaken? Good to know how far the Verbos will track; it must be based upon his own mutant design using a modern core and front end but retaining the waveshaping etc. from the original. The vintage module and related clones should indeed "only" provide about 3 octaves. Interesting did not realize Mark migrated to SMD for the 258v! Mine looked like the trimmer version above. Did anyone know the answer to this? I sold Memes the 258v, and I'd like to know whether there are different versions of the 258v calibrated differently or if this one is somehow defective. Sir, you’ve already been “slapped on the wrist” (as you called it) for trying to sell stuff whilst having fewer than 100 relevant and contributory posts. This is the 2nd time you’ve done this in someone else’s thread too. Let’s hope that this is the last time that you are naughty. I have great faith that it shall be. to be fair, i doubt it is defective, but rather built or modified specifically for this purpose. i recalibrated for 1v/oct last night and both channels tracked very well over 6 octaves. I'm fairly certain that it's a simple resistor change based on discussions related to the 258r and 259r regarding setting them up for 1v/oct operation. Unfortunately, I don't know which resistor needs to be changed. Dave Browns build notes for various 258 versions may offer some insights. The 100k resistor near to the V/O trim pot is the series resistor from the calibrated input to the CV summing amp from the looks of it. It should be possibly to adjust the value of this resistor to get the required range of adjustment.